These quilts are from our book, Covered With Love, which is available as an eBook. Click here to find it at pieceocake.com. My House from the book Covered With Love by Becky Goldsmith & Linda Jenkins. Quilt by Becky Goldsmith. Critters from the book Covered With Love by Becky Goldsmith & Linda Jenkins. Quilt by Linda Jenkins. Animal Parade from the book Covered With Love by Becky Goldsmith & Linda Jenkins. Quilt by Linda Jenkiins. I Spy Hearts from the book Covered With Love by Becky Goldsmith & Linda Jenkins. Quilt by Becky Goldsmith. I Spy from the book Covered With Love by Becky Goldsmith & Linda Jenkins. Quilt by Becky Goldsmith. 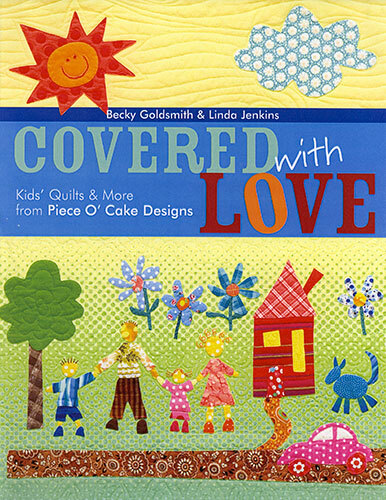 Pick Up Sticks from the book Covered With Love by Becky Goldsmith & Linda Jenkins. Quilt by Becky Goldsmith. I love this book. It looks like so much fun!!! How do I find the beautiful fabrics? These fabrics are most likely long gone. But you can almost always find good substitutes. Embrace the fabric hunt and have a good time shopping! Those Zippers are amazing. Can I get them in Australia? These patterns are so adorable! I have a 10 month old grandson and I would live to make the animal quilt fior him. Beautiful and fun for grandkids at the same time! These are beautiful and fun quilts! I have 2 nieces (each 1 yr) for whom these would be perfect! I don’t think I’ve seen this book up close. I like the stringed border on the yellow quilt. What an idea! Expecting my first grand baby…a boy. Would love to make “Critters” and “I Spy” quilts. Love this book…as well as most of your others.